Friends of Flow Water Solutions These companies have demonstrated that they stand behind their services and products that they provide to us and our customers. Manufacturers links These companies have demonstrated that they stand behind the products they supply to us. Government links For resource to find all of the laws pertaining to water wells. NOTE: What you will “NOT” find here is a set of regulations for private residential water treatment systems, as none exist at this time. 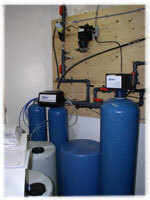 Don’t be fooled it’s “BUYER BEWARE” for private residential water treatment. There are “NO” licensing requirements for private residential water treatment systems.Here at Flow Water Solutions we treat your site as if it were a designated site were there are a set of rules and regulations. This means we only use certain products that meet these requirements.